Licking 9 volt batteries or tasering yourself with a fork stuck in a power plugs is apparently evidence enough to consider a person both a cretin and a genius. A new study presented by scientists at University of Oxford have shown that electrically stimulating the brain can significantly speed up the process of learning. The researchers studied how the structure of the brain changes in both healthy adults and stroke victim. 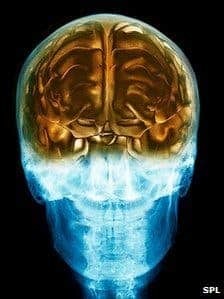 Using what’s called non-invasive electric brain stimulation, a process which involves applying a small current to specific parts of the brain, scientists observed a remarkable recovery of lost motor skills in stroke patients. When the same currents were applied to adults with healthy brains, it was found that the speed with which they picked up new motor skills — learning, in other words — improved. To accurately measure their hypothesis, scientists devised an experiment in which volunteers memorized a sequence of buttons to press “like playing a tune on a piano”. The volunteers were then split into two groups, one subjected to a short electro-stimuli session via two-electrodes enclosed inside a helmet, while the other was fitted with a placebo equipment. Prof Johansen-Berg, lead author of the study, explained that “an increase in activity of the brain cells makes them more susceptible to the kinds of changes that occur during learning“. These results show that electric brain stimulating has a positive effect on learning, especially of motor skills, when the motor cortex of the brain is targeted. Scientists emphasize though, that while the technique has shown promising results in speeding up learning, there haven’t been observed however any improvements in skills themselves. Shocking your brains off will only get you so far. “While the stimulation didn’t improve the participant’s best performance, the speed at which they reached their best was significantly increased,” said Prof Johansen-Berg. Still, the relative low-cost of such a device (£2,000 per unit) and portability, might render it useful as a commercial application in the future for customers willing to improve their concentration and learning abilities – athletes are the top market. Stroke patients with motor disabilities, could benefit greatly from such a device used in parallel with conventional physiotherapy. Currently, Professor Johansen-Berg and her team plan to investigate the potential for increasing the effect, by stimulating daily over a period of weeks to months. The results were presented at the British Science Festival in Bradford.